Austrian oculist; born at Miskolcz, Hungary, Aug. 12, 1845; M.D., Vienna, 1870. Since his graduation he has practised in the Austrian capital. 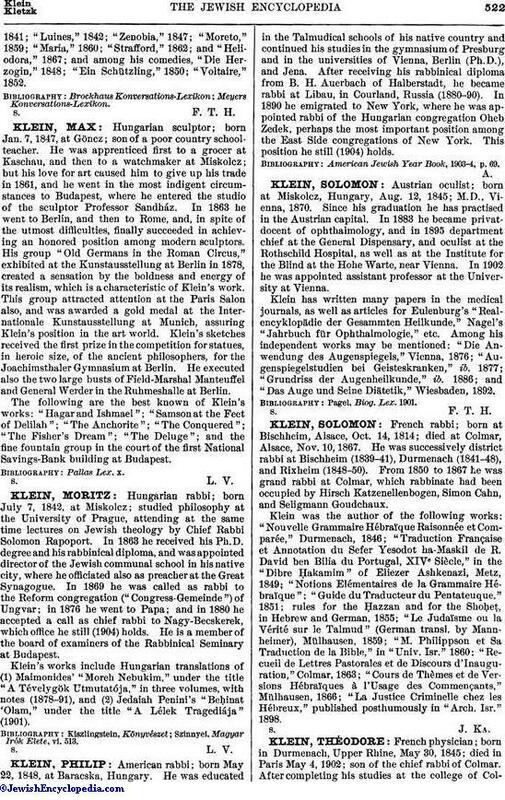 In 1883 he became privat-docent of ophthalmology, and in 1895 department chief at the General Dispensary, and oculist at the Rothschild Hospital, as well as at the Institute for the Blind at the Hohe Warte, near Vienna. In 1902 he was appointed assistant professor at the University at Vienna. Klein has written many papers in the medical journals, as well as articles for Eulenburg's "Realencyklopädie der Gesammten Heilkunde," Nagel's "Jahrbuch für Ophthalmologie," etc. Among his independent works may be mentioned: "Die Anwendung des Augenspiegels," Vienna, 1876; "Augenspiegelstudien bei Geisteskranken," ib. 1877; "Grundriss der Augenheilkunde," ib. 1886; and "Das Auge und Seine Diätetik," Wiesbaden, 1892.